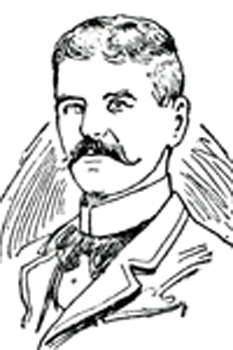 He played rugby for Cardiff (12 appearances in the 1883 – 4 and 1884 – 5 seasons) and Neath as well as winning two Welsh caps (against England and Scotland in 1885). Thomas was also a powerful swimmer and on one occasion rescued a man who was drowning in the Deep Pool, Pontsarn in Merthyr. For his heroic action he was awarded the Certificate of the Royal Humane Society. After graduation from Aberystwyth he became a solicitor in Neath and was elected to the town council in 1897 - by 1900 Lewis had been elected mayor. Lewis Cobden Thomas died in Neath in April 1928 aged 62. Councillor Lewis Cobden Thomas, who was born 35 years ago, is a son of the late Mr Thomas Thomas, of Merthyr Tydfil, who was widely known in commercial circles in South Wales. Educated successively at Merthyr College, Queen's College, Taunton, University College, Aberystwyth, and University College, Cardiff, he decided to adopt the legal profession, and was articled to Mr Charles Russell James, of the firm of Messrs Gwilym and Charles James, solicitors, Merthyr. He completed his course of study of the law by spending the last year of his articles with Messrs Schultz and Sons, the London agents of the Merthyr firm. In 1890 he entered into partnership with Mr S, T. Evans, M.P., Neath. This relationship with the member for Mid-Glamorgan lasted until Mr Evans retired from the partnership about twelve months later. In July 1891, Mr Thomas was appointed returning officer for the Glamorgan County Council. In July he received the appointment of clerk to the governors of the Neath County School, and he is also Iocal secretary to the technical classes. A few years ago Mr Thomas was one of the best known athletes in South Wales. Unfortunately, he met with an accident in the football field, which compelled his retirement from a game to which he was heartily devoted. He was elected a member of the Neath Town Council in November, 1897, and last week was re-elected by a large majority. In religion he is a Unitarian, and in politics a robust Liberal.